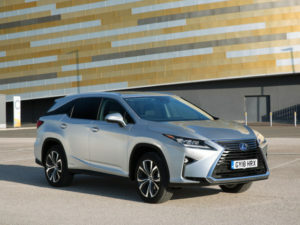 Lexus has entered the UK’s seven-seat SUV market for the first time with the launch of its RX ‘L’ model. Based on the standard RX, the new model brings a longer-length body from the rear axle, enabling it to come with an extra row of seats – equipped with power-folding functionality as standard. Just one powertrain is available – the hybrid 450hL variant also seen in the regular RX, which combines a 3.5-litre V6 petrol engine with two electric motors, giving 309bhp and equipped with part-time all-wheel drive. Three model grades are offered: SE, Luxury and Premier. Standard kit on the SE includes reversing camera, sat nav with full European mapping, 18-inch alloys, Lexus Safety System+, leather upholstery, triple-zone climate control, LED headlights with automatic high beam, and the Driver Mode Select with four different modes for throttle response times and steering. On-the-road prices start from £50,995 for the SE, rising to £54,095 for the Luxury trim and £61,995 for the top-of-the-range Premier model.